Researchers are eyeing a gene therapy they hope could eventually ameliorate most kinds of amyotrophic lateral sclerosis. A dose of up-frameshift protein 1 (UPF1) prevented degeneration in neuronal culture models of sporadic ALS, and versions due to TDP-43 or FUS mutations, according to a paper in the Proceedings of the National Academy of Sciences USA online June 8. Moreover, gene therapy in a rat ALS model produced startling improvement, preserving forelimb motility, as reported in the January Gene Therapy. “We are still not completely sure how it works,” said Gregory A. Petsko of the Weill Cornell Medical College in New York, who co-led the studies with Dagmar Ringe of Brandeis University in Waltham, Massachusetts. Right now, the authors are investigating the possibility that UPF1 bolsters the cell’s ability to dispose of nonsense mRNAs that contain premature stop codons. However, Petsko prioritizes finding a cure over understanding the mechanism fully, and has started negotiations with companies to develop the gene therapy further. “I think we have a reasonable chance that this is going to get tried out in people,” he said. In addition to ALS, frontotemporal dementia caused by TDP-43 or FUS pathology might be a disease target, Petsko said. It all started with a fungus. Shulin Ju, working with Ringe and Petsko, screened yeast for suppressors of FUS toxicity. Ju, who now runs his own lab at Wright State University in Dayton, Ohio, identified UPF1 as a powerful protector (see May 2011 news on Ju et al., 2011). UPF1 acts as a helicase to unwind RNA and regulates the destruction of RNAs containing nonsense codons; it also participates in RNA splicing and transport. To test UPF1’s effects in a mammalian system, the authors struck up a collaboration with Sami Barmada in the laboratory of Steven Finkbeiner at the Gladstone Institutes in San Francisco. Finkbeiner’s lab uses automated microscopy to track the survival of individual neurons over time, allowing the researchers to calculate the risk of cell death for different treatments (see image below). As reported in the PNAS paper, Barmada transfected primary rat cortical neurons with wild-type TDP-43 and FUS, and mutant versions of each. Since TDP-43 accumulates in sporadic ALS, the authors believe these models represent both sporadic and genetic disease. To some cultures, he also added the gene for UPF1. “We saw a huge effect size,” said Barmada, who now runs a lab at the University of Michigan Medical School in Ann Arbor. UPF1 diminished the risk of cell death by 20 to 50 percent. Petsko presented these data at a 2011 meeting in Arlington, Virginia (see Nov 2011 news). He said, “If anybody would like to try UPF1 in their TDP-43 or FUS model, come talk to me.” Up came Ronald Klein of the Louisiana State University Health Sciences Center in Shreveport, offering his rat model of TDP-43 disease. His lab employs adeno-associated virus (AAV) to deliver a wild-type human TDP-43 transgene to the rat spinal cord (see Mar 2009 news on Tatom et al., 2009; Wang et al., 2010). This reliably causes hindlimb paralysis in all rats, as well as forelimb paralysis in about 75 percent of animals, depending on the vector dosage, Klein told Alzforum. Klein and Kasey Jackson, first author on the Gene Therapy paper, managed to stuff all 47 kilobases of UPF1 into adenovirus and inject it intravenously. When Jackson treated the first set of rats, she noticed a difference right away. As the rats moved around their cages, it was obvious which ones had received UPF1, because they walked better. In a battery of tests, they balanced better on a rotating rod, walked farther during a 30-minute period, and dangled longer from a wire mesh before falling. While their hindlimbs remained paralyzed, they could still reach with their forelimbs (see image above). The researchers might be able to optimize the treatment to achieve hindlimb benefits, too, Petsko said. They can vary the dose of AAV, use a different virus strain, or deliver it directly to the nervous system instead of intravenously. UPF1 rescues neurons and rats from the toxic effects of TDP-43 and FUS—but how? Barmada’s study offers some clues. Initially, the authors thought UPF1 might be a general promoter of neuron survival, but they found it made no difference to the death rate of control neurons. Neurons expressing a polyglutamate expansion or mutant human SOD1, another ALS gene, were similarly unaffected by extra UPF1. “This provides some of the first evidence that the SOD1 form of ALS is distinct, and will probably require distinct treatment strategies,” Petsko said. UPF1 is a master regulator for nonsense-mediated decay (NMD), a known RNA surveillance mechanism that degrades unwanted RNAs. It gets rid of RNAs with nonsense codons that create premature stop sites, and also participates in the natural cycle of turnover for proper RNAs. Barmada and colleagues treated the cultures with the NMD inhibitor NMDI. This drug curtailed the survival of UPF1-treated neurons, suggesting UPF1 promotes survival, at least in part, by amplifying NMD. As it happens, TDP-43 and FUS both inhibit their own RNAs, routing them toward NMD by creating alternate splice forms (see Jan 2011 news; Zhou et al., 2013; Polymenidou et al., 2011). Brian Freibum of St. Jude Children’s Research Hospital in Memphis, Tennessee, who was not involved in the research, commented that enhancing NMD of TDP-43 and FUS RNA, which would effectively downregulate the toxic proteins, is a likely explanation for the benefits Barmada and Jackson observed. “The evidence is teasingly suggestive that UPF1 might work by NMD,” said Petsko, though he added that at this stage, “I would not rule anything out.” Barmada offered a second hypothesis, noting that TDP-43 and UPF1 are binding partners. The presence of additional copies of UPF1 from the gene therapy might sequester toxic TDP-43, he speculated. Alternatively, the cellular TDP-43 might grab and inhibit UPF1, but the added UPF1 could overcome this effect. 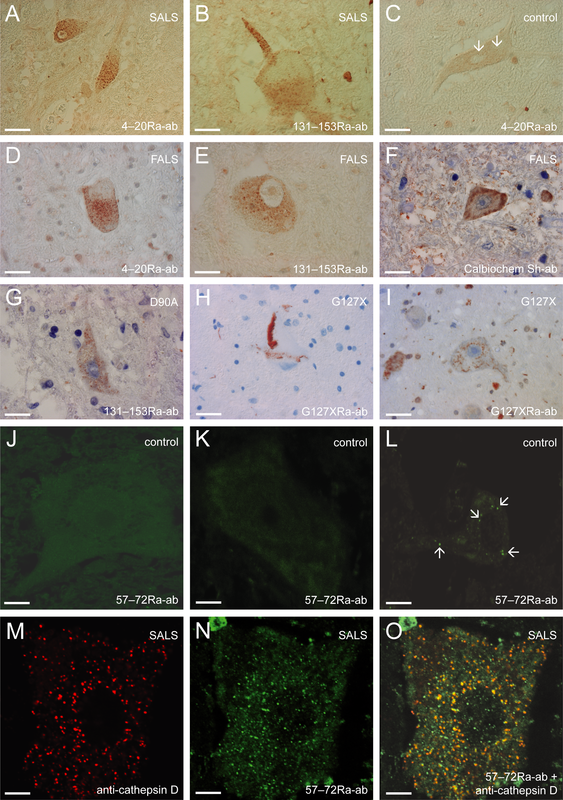 Barmada SJ, Ju S, Arjun A, Batarse A, Archbold HC, Peisach D, Li X, Zhang Y, Tank EM, Qiu H, Huang EJ, Ringe D, Petsko GA, Finkbeiner S. Amelioration of toxicity in neuronal models of amyotrophic lateral sclerosis by hUPF1. Proc Natl Acad Sci U S A. 2015 Jun 8; PubMed. Jackson KL, Dayton RD, Orchard EA, Ju S, Ringe D, Petsko GA, Maquat LE, Klein RL. 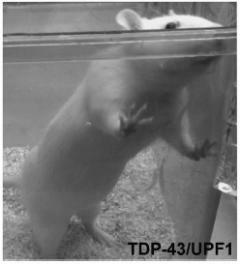 Preservation of forelimb function by UPF1 gene therapy in a rat model of TDP-43-induced motor paralysis. Gene Ther. 2015 Jan;22(1):20-8. Epub 2014 Nov 6 PubMed.